Evan at Ten and a Half Months Old - Pulling Himself to Kneeling! It's time for another blog entry about all of Evan's latest and greatest accomplishments. It's a good thing I keep track of them in his first-year journal - otherwise I'd never be able to remember them for the blog and his baby book. Evan got into the routine of daycare without too much trouble. The days he is there, they feed him food before his nap, and then they call me to come over to nurse when he wakes up, and we do this cycle twice a day. At first, he would start crying as soon as he saw me, and then when I was leaving, but it has gotten better over time. Evan is learning to wave in response to being waved at. He is shrieking and grunting a lot, his way of participating in the conversation! Evan can respond to his name. He likes to grab his spoon and chew on it - he chews on everything! Definitely in the oral stage of development! We've been introducing more foods - he likes everything! 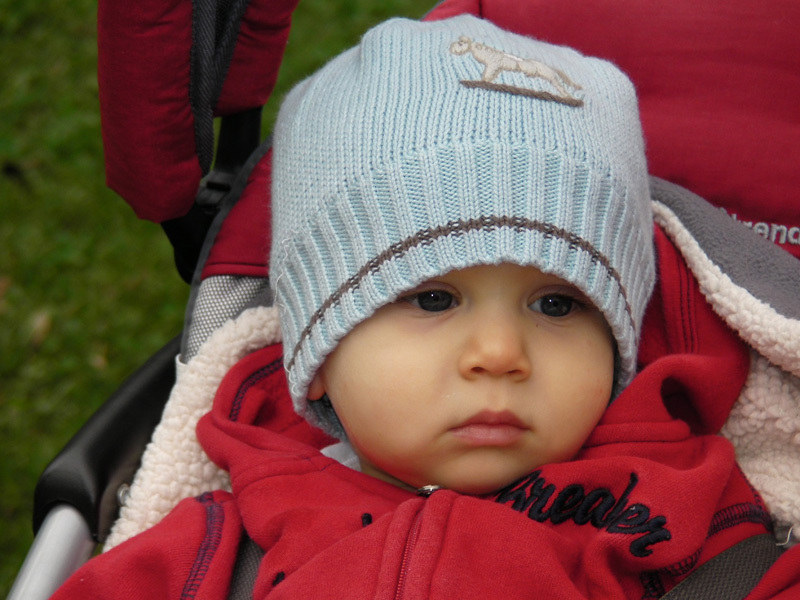 He developed red, itchy, blotchy eyelids, but with the doctor we've determined it is eczema, not a food allergy. Evan is still taking two long naps each day, plus sometimes a shorter third nap before bed. He is still not consistently sleeping through the night. He is trying to communicate - pointing at his mobile to tell us he is excited about it. He can throw his toys, and looks for them when he drops them. Object permanence! He's getting better and better at sitting when we put him in a sitting position. He always grabs my glasses off my face! At eight and a half months, he started crawling! All of a sudden he is able to do the army crawl! He love to eat - he opens his mouth wide for more food. He doesn't love pureed chunky food like chicken or textured food like bananas, but he loves to eat his baby food, cereal, and yogurt! 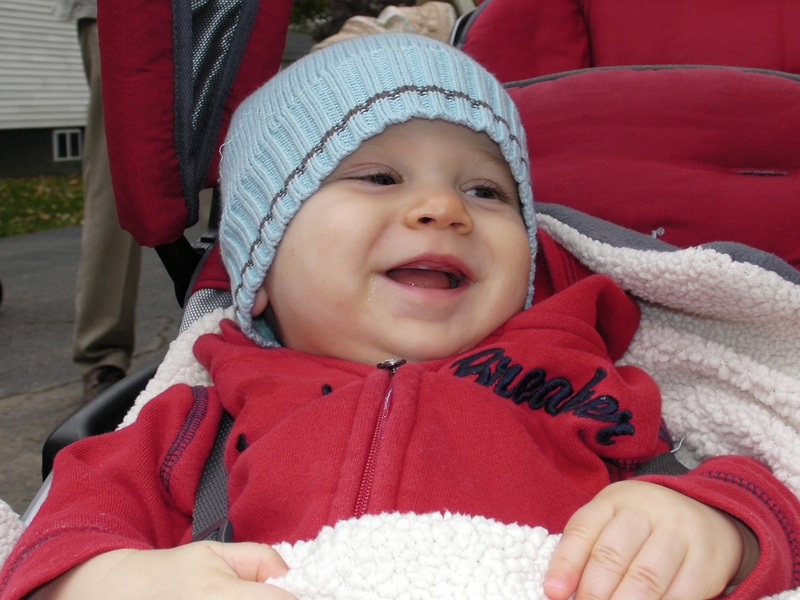 He is getting two more teeth - his top front teeth, the right one first. Evan is a great army crawler, using mostly his elbows to pull his body around, with his little feet scampering behind him. He can sit up unassisted using our legs as support - he still can't get himself to a sitting position on his own. He can wave in response to a wave - he does this one-arm straight out wave - so cute. He is learning to raise both arms for "So big!" He still loves to nurse. He loves to chatter and babble. He recognizes those people he knows well and greets them with a smile. He laughs a lot - Daddy and Seth especially can make him laugh. He likes to play with Seth. Still takes normally two naps a day, and sleeping at night is variable - sometimes 8 to 10 hours, sometimes up multiple times. He is so squirmy and flippy during diaper changes - have to use the floor now. He chews on his sleep sack to fall asleep. He will only fall asleep occasionally when nursing now. He has four teeth now! With these four teeth, unfortunately, he bites me sometimes when nursing. We are working on it! We are trying to teach him baby signs for "more" and "help," with Seth's assistance. When Evan drops a toy, Seth will sign for help before he returns the toy. He is starting to push up and down a little bit when crawling. He is very fast - he will crawl after his toy, grab it, flip onto his back, and put the toy between his legs so he can bat at it. We still think he is part monkey! Jason likes to say he is doing baby martial arts. He is still a little blondie, looking a lot like Uncle Brian did when he was young. Weighed 18 lbs 14 oz at his 9 month check-up, and was 27 inches long. Moving right along! Evan is getting better at using the pincer grasp on Cheerios. He likes the dropping game! He's battled a couple colds - part of being a baby, I guess! Even faster at army crawling! Even better at sitting unassisted! His one-armed wave is firmly established. Can reliably stick both arms up for "So Big!" Learned a baby sign from us - clasps his hands - combined the signs for "more" and "help" - we think he just figured out we want him to do something with his hands! Is tentatively calling me "Mama." Very exciting first word! Doing much better pincering cheerios, cheese, avocado - still can't get them in his mouth, though. Sleep at night still variable. He is getting a fifth tooth - upper left lateral incisor! Evan loves Seth - his face lights up when he sees him. He's starting to be able to take some baths with Seth, with lots of assistance from Mommy or Daddy. Still a little monkey with his acrobatics while on his back! Definitely his favorite position. Evan has gotten the hang of signing "more" - sometimes palm to finger like Seth did. He finally figured out how to pincer food and put it in his mouth! Big lightbulb went off! He's eating more solids - pasta, chicken, avocado, cheese, cut up really small, plus plenty of baby food, yogurt, cereal. So full of energy, always moving. Once he notices us at daycare, he crawls over desperately. Has 5 teeth! Still working on biting when nursing, but still going strong with nursing. Evan is Working on drinking from a sippy cup! He is saying "Mama" to me reliably - definitely his first word. He loves to bang two objects together to make music. He likes to shake instruments like egg shakers and maracas to make noise. His hair is getting a little longer - still very light - finally, a little curl in back! He is eating cut-up solids really well in addition to his pureed foods - he is a pincer expert! 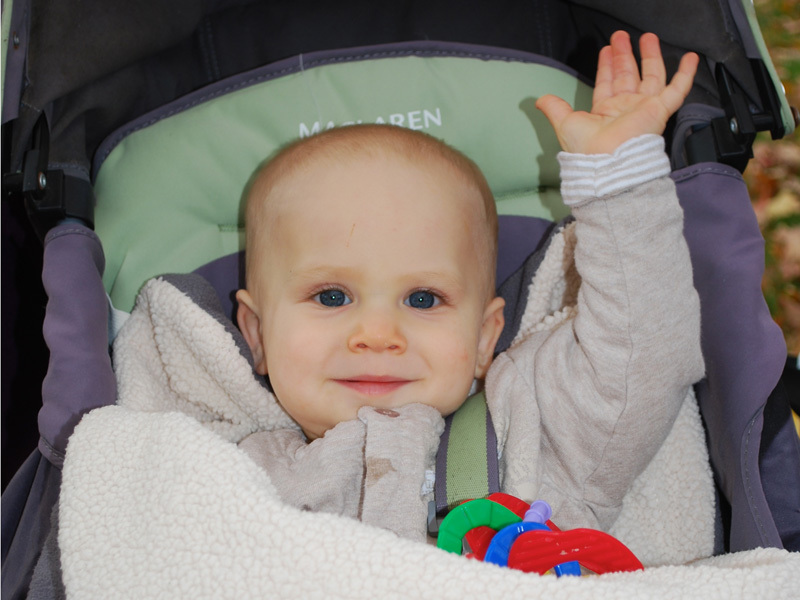 He can follow simple directions, the best being "Wave hi to Seth!" Still babbling and jabbering in conversation! He's Working on putting objects in containers. He can sit in a highchair at at restaurant and eat with us. 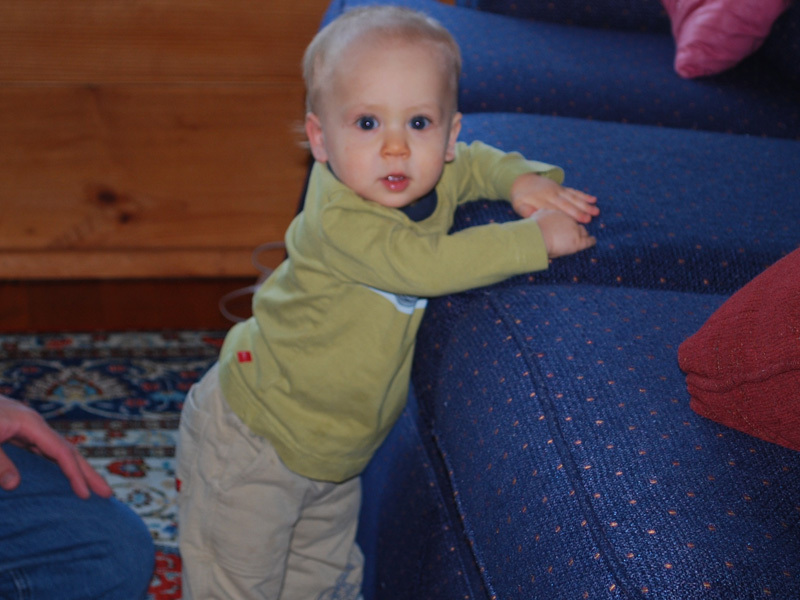 Over Thanksgiving weekend, he got up by himself on all fours, and was also able to hang onto the couch if we raised him up. Then, just last week, he pulled up to kneeling on the learning table all by himself, and then pulled up to standing right after. This required a quick lowering of the crib and removal of the mobile! Over the week, he's gotten really good at pulling up to his knees at the learning table and Seth's toy boxes. You have to be right next to him because he is so precariously balanced. He's still such a little baby and is it funny to see him on his knees peering into toy boxes. He has so much energy he gets mad when we put him to sleep because he wants to keep experimenting. He can pull up to his knees in his crib, too. He is a much better sitter, though he still can't get to a sitting position himself. He is pretty close to being able to move himself from sitting to crawling. His new sitting skills mean he can take a much longer bath with Seth now - the two of them sit up and pat the water and laugh with our supervision. It is so cute! He is still not sleeping through the night - back to wake ups to nurse at 11:00pm and 4:00am. He might be teething - lots of drooling and chewing. We can't believe Evan is already approaching age one. It has been a joy to have Evan in our family, and it is amazing to see the two brothers having so much fun together. We know is is a preview of what's to come!